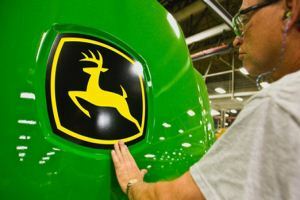 Several brand new John Deere products were recently introduced at the 2014 John Deere Product Introduction in Columbus, Ohio, as Deere and Company focuses on “Delivering Distinctive Value” to its customers for the year ahead. New updates and equipment for farmers, ranchers, and residential customers including tractors, agricultural equipment, mowers, and implements aim to increase productivity for any task at hand. Tractor updates and new introductions were made across the 3E, 3R, 5E, 7R, and 8R/RT series tractors, boosting power, performance, and control. New track upgrades for S-Series Combines, new self-propelled windrowers and sprayers (W235, R4030 and R4038), nutrient applicators (2510L Liquid Fertilizer Applicators), and the WR60 Series High-Capacity Carted Wheel Rakes will likely assist agricultural producers in the field. For commercial and residential customers, several new models were made across front mowers, ZTrak, walk-behind, QuikTrak, and riding mowers. Each of these new products aims to follow the “Delivering Distinctive Value” mantra Deere spotlighted at their 2014 product introduction. Customers across industries will find new pieces of equipment and upgrades that aim to simplify processes regardless of the task at hand.